From 15 August 80 Wings commander, Lt. Col. L A Strange, switched the Wings targets to German airfields. There followed attacks on Harbourdin on 15 August and on Lomme (Jasta 2s base) two days later. These attacks used all the fighter squadrons (88, 92, 2AFC & 4AFC) of the Wing. Col. Strange led these attacks himself and some 65 aircraft were involved. No 103 Sqn in the meantime continued high level bombing, weather permitting. Lomme was bombed by 103 sqn on 19 August and were attacked by 8 Pfalz scouts at 15,000 ft, Capt. Sparks and Lt. Loly leading the formation claimed one Pfalz destroyed. Lomme was bombed on 25 August and on this raid the formation was attacked by 10 Fokker aircraft at 14,000 ft, in the ensuing fight two EA were claimed destroyed and three EA driven down OOC; Capt. Stubbs & Lt. Russell and Capt. Dodds & Lt. Corey made two claims each. German airfield at Marcq with screening smoke, six canvas hangars visible. The Battle of Bapaume commenced on 23 August 1918 and for the first time attacking Divisions of the British Third and Fourth Armies were given distant rather than limited objectives. The Germans were considered to be in a sufficiently weakened state that they would be likely to withdraw in the face of resolute action. Bapaume and St Quentin were taken by 1 September. The British First Army to the north and on the left of Third Army opened an offensive on 26 August, the Battle of the Scarpe. X Brigade supporting the Fifth Army to the First's left extended their offensive patrols South to provide additional support. These offensives marked the start of the general movement Eastwards pushing the German Army back. The offensive paused and from 5 September orders were issued to allow RAF squadrons some rest with a marked reduction of fighting squadrons being required to cross the lines. The final assault on the main German defences of the Hindenburg line commenced on 27 September. See map of the British area of operations. On 27 August, in answer to a call from I Brigade who reported considerable troop movement opposite the battle front in Biache, 103 Sqn carried out a raid in very bad weather, and dropped 10 112LB bombs. A similar raid in bad weather was later carried out on La Miterie aerodrome. On 30 August separate reconnaissance missions between Bac St Maur and Armentieres and over Laventie, respectively, were attacked by formations of enemy aircraft. Capt. Stubbs & Lt. Dance claimed one EA driven down out of control. Lt.s Hett & Eddy were attacked by seven Fokker Triplanes, Eddy was shot through the thigh, but in spite of his wound destroyed 1 EA whose wings fell off, and shot down another EA out of control. Both crews returned safely apart from Eddy's injury. From this point on the squadron was targeting airfields and railway junctions more or less due east of their base at Serny. 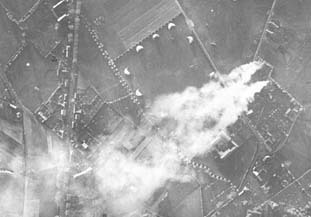 103 Sqn were in action on 16 September attacking targets around Lille including Lomme airfield; 2nd Lt. Cole & Sgt. Hookway were killed in action having been attacked by two EA when they fell behind the formation, possibly with engine trouble; Capt. Ayrton & 2nd Lt. Jenkins having been seen to spin down emitting smoke, were presumed to have been hit by ack-ack, and were taken prisoner - the latter however died of wounds. The returning formation was broken up by heavy ack-ack fire. Two days later during a raid on Harbourdin, Lt. Phillips & 2nd Lt. Owen were killed in action over Lille, assumed to be hit by ack-ack and observed to spin down and crash from 15,000 ft (now believed shot down by Jasta 52 pilot OfStv O Sowa). On 24 September during a bombing raid on Sante, the formation was attacked by some 20 EA and had to fight their way home latterly supported by No 88 Sqn Bristol Fighters. Lt.s Chrispin & Bannerman claimed one EA OOC. Lt. Heebner & 2nd Lt. Davenport photographing this raid, were missing later confirmed killed in action over Lorgies; Lt. Noel was also killed and his observer Sgt. Ovens taken prisoner after being attacked by four EA over La Bassée. On 27 September the Squadron ran into what they believed to be Richthofen's Flying Circus after two bombing raids on Wasne-au-Bac (N. of Cambrai), maintaining a tight formation the DH9s suffered only one wounded in action, Lt. Crees, an observer. (It is unlikely to have been Richthofen's JGI which was was further South but may have been JG III which included Jasta 2 (Böelke)). At the beginning of October Fives Junction (Lille) was a frequent target being attacked on the 1st, 2nd, 3rd and 4th. On 7 October Sgt. McKie & 2nd Lt. Pitot were brought down by ack-ack on a bombing raid on Denain (at 14,000 ft), the former being killed and the latter dying of wounds or injuries on landing. Of nine aircraft on this raid three had to return with their bombs following engine trouble. By comparison during the raid carried out three days before, on Fives Junction, 10 aircraft had reached the objective with no drop outs, though this seemed exceptional. On 18 October four Squadrons of 80 Wing carried out a large raid on Tournai and district, with eight aircraft of 103 sqn led by the CO Maj Nethersole coming down to 2500 ft, in their first low level attack, dropping 16 112lb bombs on Tournai station. 2 AFC attacked their targets at 50 to 1000 ft. All aircraft returned safely.The raid is recorded in RAF Communique 29 (see below). A very successful bombing and machine gun attack on Tournai and district was carried out by 2 and 4 Sqns AFC, 88 and 103 Sqns under extremely bad weather conditions ... (2 AFC leading the attack at low level) obtained four direct hits on trains in the vicinity of Tournai. Seven direct hits with bombs were secured on hangars on Froyennes aerodrome ... The aerodrome at Pont-a-Chin received direct hits on hangars, three of which were set on fire. 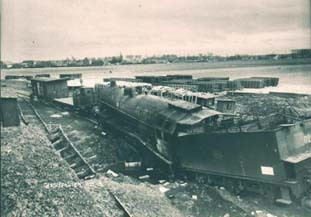 103 Sqn, following 2 AFC, caused a large explosion in Tournai Station with bombs and started several fires ... an ammunition train received a direct hit, several explosions started and the train was seeen to be burning from end to end. Engine and track destroyed at Ghislengheim (Bassilly) on 10 November 1918 by Lt. Hallawell and Sgt Watkinson making a lone attack from 8,000 feet with a 230 lb bomb after the rest of the formation "washed out" due to bad weather. On 23 October, nine machines of 103 Sqn led by Capt. Dodds at 12,000 ft dropped 4 230lb and 10 112lb bombs on Leuze. A tenth DH9 returned home with engine trouble. The formation was attacked by 10 Fokker Biplanes who were unable to make any impression on them; two EA were destroyed, two were sent down out of control, and another driven down. Two claims were made by Sgt. Haines & 2nd Lt. McDonald and one by Sgt. McNeill & 2nd Lt. Davison. Three days later Lt. Chrispin led an eight aircraft raid on Ath but diverted to Leuze because of poor visibility and dropped 2 230lb and 12 112lb bombs from 13,500 ft; 4 EA were seen over the objective but did not attack.